Kendall and Kylie Jenner have only been out of the country for a day and they've already made a friend! The reality TV stars, who were seen flying out of LAX with their famous sisters and mother, Kris, on March 27, looked to be having a great time on the first day of their exotic getaway. 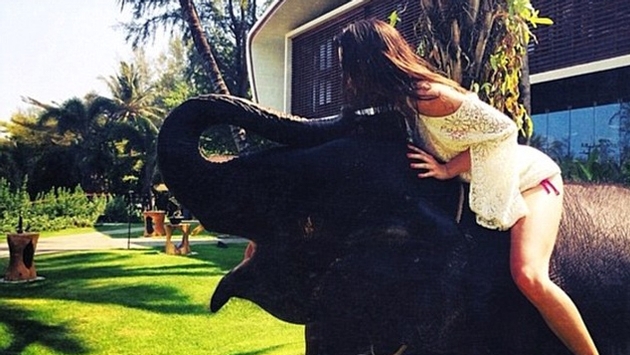 Posting photos on Instagram, the girls were seen riding on top of an elephant, with Kylie, 16, writing "and then this happened..."
Kendall commented on her photo, "I got elephant kissed today." Kim, Khloe and Kourtney Kardashian were nowhere to be found in the pictures, but Kendall and Kylie had been accompanied by them when they arrived for their flight on March 27. Kim posted a photo of the pair, and Khloe as they stood close to the runway, while a plane could be seen in the distance. What do you think? Should the family film their vacation for "Keeping Up With The Kardashians"?